The Coveo connector needs to connect to the Liferay portal using an account that has read access to all the Liferay content that you want to index. The Coveo connector only reads and does not modify the Liferay content. The best practice is to create a Liferay fixed password account used exclusively by the Coveo connector and assigned to the built-in Administrator role that has complete access to all Liferay content. Using a Liferay account that has an Administrator role, sign in to your Liferay portal. On the menu bar, select Manage > Control Panel. In the Liferay Control Panel, in the navigation panel on the left under Portal, click Users. Click Add to create a new user. Under New User, enter arbitrary information describing the Coveo Connector user. In the navigation menu on the right, click Save. In the navigation menu on the right, under User Information, click Roles. Under Regular Roles, click Select. In the window that appears, under Roles, click the Administrator, to assign the Administrator role to the account. If the Power User role has been assigned automatically, click Remove on the corresponding line, to ensure that only the Administrator role is assigned to this user. In the navigation menu on the right, under User Information, click Password. Enter a strong password in both the New Password and Enter Again boxes. Leave the Password Reset Required checkbox cleared to prevent forcing the user to change the password when logging in the first time. Note: If the password changes in Liferay, you will also need to change it in the CES user identity (see Adding a User Identity). 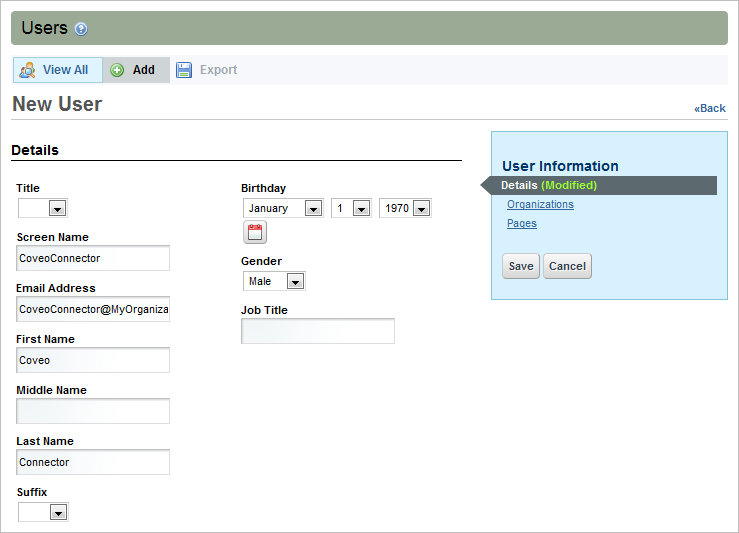 On the Coveo server, configure a CES user identity for your Liferay crawling account (see Adding a User Identity). Configure a security provider for your Liferay portal (see Configuring a Liferay Security Provider).